For many people, interviews are the toughest part of a job hunt. Being forced to sell yourself doesn’t come naturally to many and a lot of candidates become nervous and anxious both before and during important interviews. As a result of these nerves, interviews often don’t go the way we’d hope. 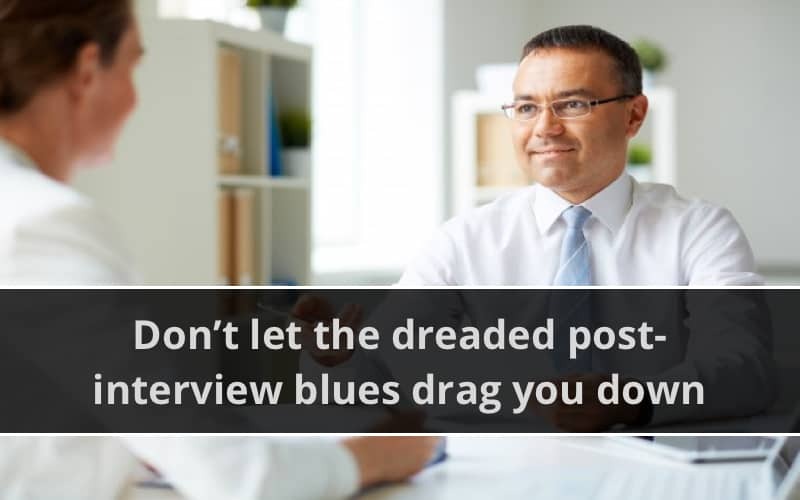 Bad interviews can lead to candidates being consumed by self-doubt and can cause many to feel depressed and frustrated in the days and weeks following the meeting. If you’re about to start out on a job hunt of your own, there’s a good chance you’re going to have to attend at least a few interviews at some point during the process. Getting yourself in the right frame of mind before the interview takes place, and finding strategies to cope with the suspense of waiting for your answer after the meeting, will help your job search to feel less stressful and could even help you to secure the job of your dreams. A lot of the time, post-interview blues are brought on because people feel like they made mistakes or didn’t perform as well as they should have. This can lead to self-doubt and can cause many applicants to wallow in the post-interview blues for days, weeks or even months. The best way to avoid the risk of plunging into a pit of despair after your interview is to prepare as thoroughly as possible. Try to learn as much as you can about the company, its history and its plans for the future. If you have time, you can also try to find out a little about your prospective interviewer using LinkedIn or the company website. This should help to make the prospect of the interview a little less daunting and will help to make you feel less nervous on the day. Preparing a few intelligent questions to ask at the end of your interview is always a good way to stand out from the crowd. Ideally, you should ask questions that show you have researched the company and can offer insight into both the business and your prospective role. You could also prepare a few suggestions for projects or concepts you’d introduce if you were offered the position. This shows that you’re motivated, dynamic and that you have the innovation needed to help the business succeed. If you don’t think your current interview technique is up to scratch, try to work on it a little before you next apply for a job. A professional coach will be able to offer you useful and practical career advice on how to come across well in an interview. They’ll also be able to help you tidy up your CV, something that can make getting an interview more likely in the first place. Once the interview has taken place, try to put it out of your mind as far as possible. Replaying the meeting over and over again in your head won’t help to change the outcome and will only make you doubt your interview technique and your professional capabilities. Although you probably won’t be able to forget about the interview altogether, try to keep yourself busy by applying for other jobs, staying active and getting as much exercise as possible. The busier you are, the less likely you are to dwell on how well, or how badly, you think your interview was. Try not to put all your eggs in one basket by applying for just one or two jobs. Even if the roles you’ve found are perfect, submitting just a few applications will pile the pressure on when it’s time to interview and will probably cause you to obsess about the meeting even after it’s done and dusted. Instead of applying for just a few jobs in Norfolk, apply for as many jobs as you can find. Even if the roles aren’t perfect for you, doing multiple interviews is a great way to brush up on your skills and it will also help to take your mind off the wait. There’s nothing worse than being kept in the dark when waiting for news on a job interview. If you can’t stand the suspense, why not call up the company that you interviewed with to find out how they’re getting on. Ask if they’ve completed their current round of interviews and when candidates can expect an answer. As well as helping to calm your fears, this shows that you’re keen and should help to make you more memorable, something that can be a real positive when it’s time for round two. If your interview wasn’t successful and you didn’t get that longed-for job, don’t despair, you can still get a lot out of the process and use it to inform your future job hunt. Talk to your interviewer and ask for feedback on your CV, your interview and your general performance. Although criticisms can be hard to hear, this is an incredibly valuable way of improving your interview technique – something that could help you to come out on top next time you get an important interview. Even if you think the interview went very badly, it’s important that you try not to panic. Panicking will only make you feel worse about yourself and make you less motivated to continue your job search. Instead, try to put it behind you, move on and focus on the future. If you need help preparing for an interview, or if you’re searching for jobs that fit your skills and your experience, we can help. Get in touch with a member of our team or take a look around Just Norfolk Jobs today to find out more. She is Marketing & PR Executive for Just Norfolk Jobs and has been since October 2017. Manya has a vast amount of HR & Recruitment experience coupled with her local knowledge of the Norfolk & Norwich area.